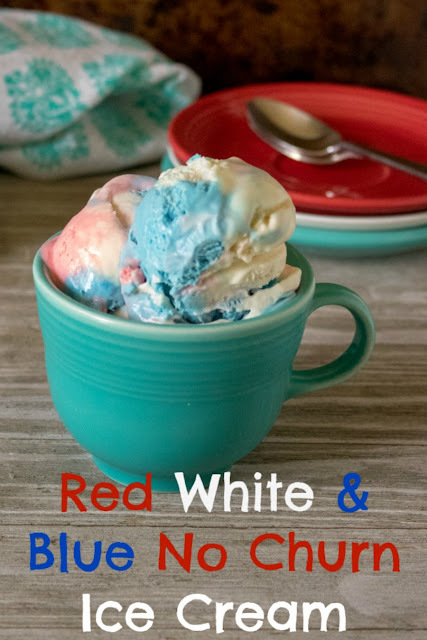 This festive red, white and blue ice cream is easy to make and no-churn so you don't even need an ice cream maker! 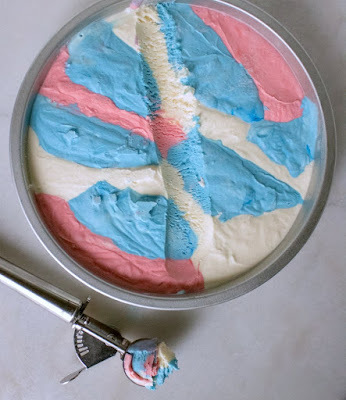 This red, white and blue no churn ice cream is super easy to make and so patriotic. Make a batch for Memorial Day, Independence Day and Veteran's Day. Then go ahead and make a batch for all of the days in between as well! Happy Veteran's Day! I figured we should celebrate with a little red, white and blue. Luckily getting festive doesn't have to be hard. 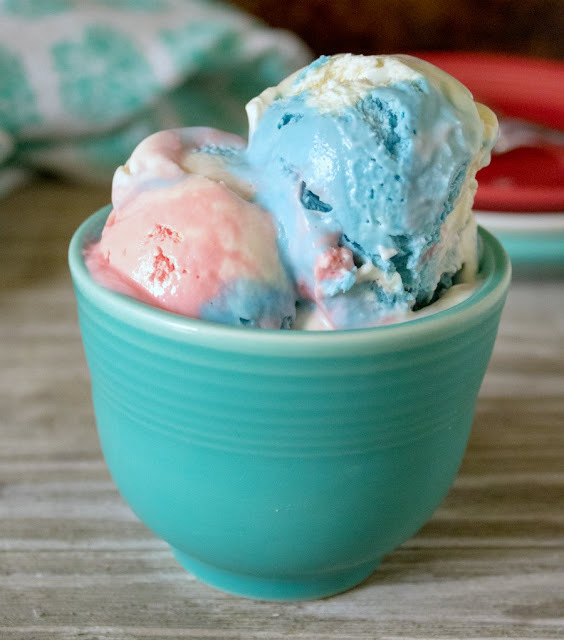 This ice cream only takes a few ingredients and the hardest part is waiting for it to freeze! It is super festive on it's own, but if you wanted to add some whipped cream, a cherry and some sprinkles I wouldn't blame you a bit! Either way it will make you feel patriotic. Whoever invented no churn ice cream should be both celebrated and cursed. The good news is it's so darn easy to make. The bad news is it's so dang easy to make! That means there's very little standing between you and the ice cream of your dreams at all times. Veterans Day is a perfect day to stop and appreciate all we have and all of those who have fought to give us the freedoms we enjoy. While we are far from perfect, we do have an awful lot to be proud of and thankful for. So say thank you to a veteran or two today, and maybe make them some ice cream! In a large mixing bowl, whip cream until it forms stiff peaks. 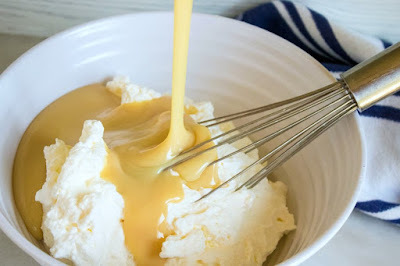 Fold in the sweetened condensed milk and vanilla. Divide ice cream into three bowls. 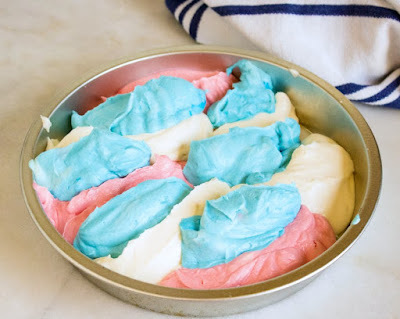 Add red food coloring to one, blue to another and leave the third white. Alternate plopping bits of ice cream into a freezer safe container to make a nice swirl of colors. Tap the pan on the counter a few times to even it out and then freeze for 5-6 hours or overnight. Allow to soften on the counter for 5-10 minutes before serving. Its so so pretty and sounds delicious!!! 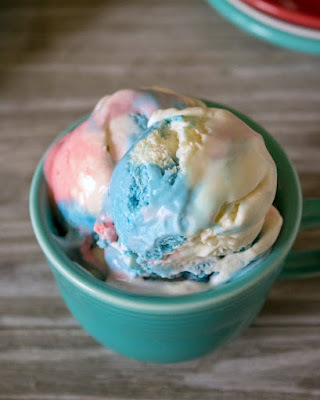 Perfect for Veteran's Day and I think I'll save this recipe for next summer, so festive and no churn makes life a lot easier! Happy monad sweet friend! No churn does make it simple and you could easily mix up the colors for any event! What a fun dessert! And a lovely way to celebrate Veteran's Day! Quick easy and could easily be changed for any holiday! Thanks, Kelsie! One can never have too many ice cream recipes. It is close to being right up there with Frosting! Ha! I couldn't agree more!